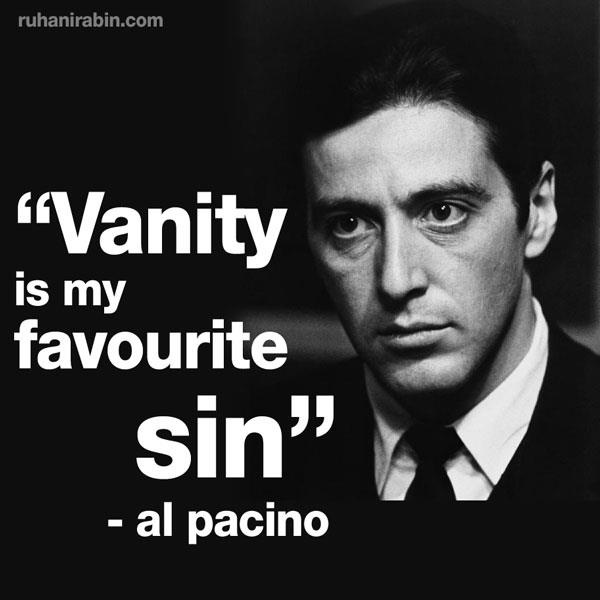 If a license plate is named after one of the deadly sins, you might want to avoid it (unless you’re Al Pacino). Last weekend, I had the opportunity to be in Los Angeles—which I really like, before you start with the grimaces. But maybe my pleasure came partially from the fact that I was not driving. The few times I had to travel about the freeway system, battle-weary cabbies did it for me. My passenger status allowed me the luxury of looking at my surroundings as they flew by in a blur. But L.A. traffic jams also allow a more relaxed view of Southern California, and that is when I got to see my share of vanity license plates. I’ve remarked before on the presence of lawyer license plates, and Above the Law has had some fun at the drivers’ expense. Even in the required shortened form, I understood immediately we were behind Mens Rea. Can’t recall law school? Well, it’s that quotable bit of Latin that refers to criminal intent, a necessary element to establish guilt. Why a lawyer would gleefully holler “malice” from his plate, I don’t know. But it seems to fall in nicely with the humblebrag, the sly sharing of mundane personal information that covertly tries to toot your own horn. An Arizona license plate of a decidedly different variety. 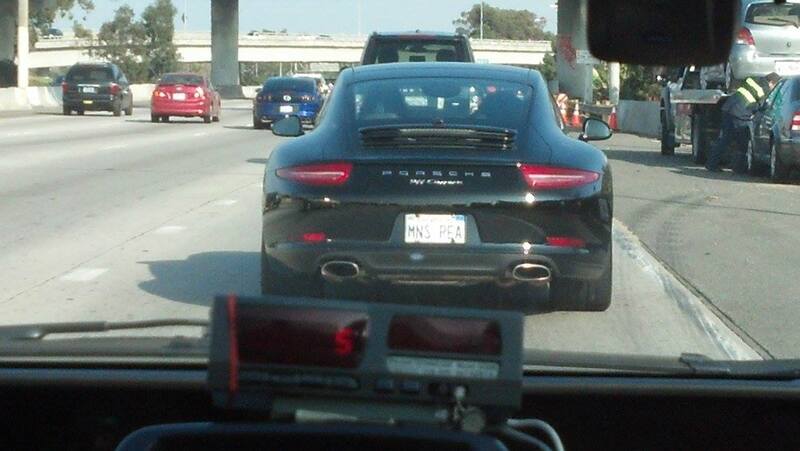 Not impressive enough that the driver’s in a Porsche? Well, he (or she, I couldn’t tell) is also happy to let you in on the secret that a successful lawyer career paid for that machinery from Stuttgart-Zuffenhausen. What do you think of vanity plates? 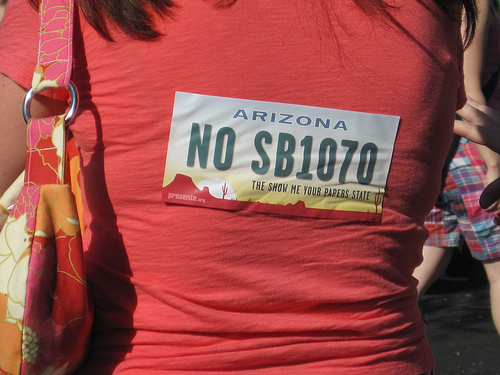 If you catch a photo of one that makes you laugh—or seethe—send it to me at arizona.attorney@azbar.org. The State Bar of Arizona and Univision 33 hosted the final Abogados a Su Lado (“Lawyers at Your Side”) of 2012 on Monday, December 10. The following is a recap from the public service program. Can I get my license reinstated after receiving a DUI? How does receiving a misdemeanor charge affect my immigration case/status? How is a potential sentence determined? Should I hire a private attorney or use a public defender? What are the differences? What are the repercussions of getting a DUI? How do I take care of a warrant issued in another state? All the Abogados a Su Lado volunteers were first-time participants. Calls were consistent from 5 to 7 p.m., which led to another successful phone bank. In 2012, 20 Abogados a Su Lado volunteer attorneys answered legal questions from 284 consumers during three separate phone banks. The State Bar of Arizona and Univision 33 will continue to provide the Abogados a Su Lado public service program in 2013 and are currently identifying dates and topics for the new year. If you are seeking some lunchtime learning, a few upcoming webinars may fill the bill. The following are co-sponsored by Fordham Law School and The National Law Journal. 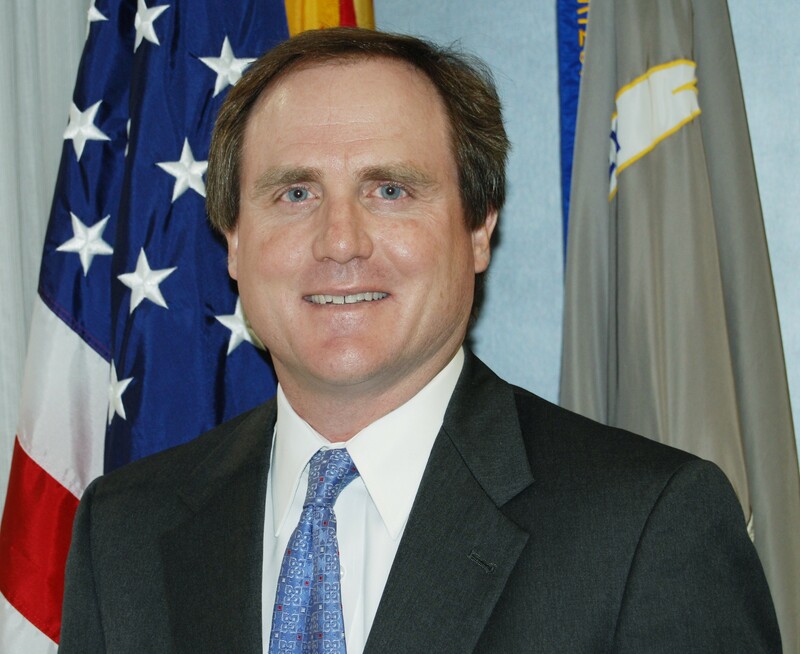 And are any of the topics something you’d like to see covered in Arizona Attorney? Let me know, and we could slot an article. Panelists will focus on the ethical issues that often arise during criminal cases and the recent developments in ethics and professional responsibility. Speakers include: Hon. Jed S. Rakoff, Judge for the U.S. District Court for the Southern District of New York; Bruce Green, Professor and Director of the Louis Stein Center for Legal Ethics at Fordham Law School; Rita M. Glavin, Partner at Seward & Kissel LLP; and Sylvia Shaz Schweder, Assistant U.S. Attorney for the Eastern District of New York. Discussion will center on important trends in foreclosure law in the wake of the housing crisis. Speakers include: Nestor Davidson, Professor of Law and Founding Director of the Urban Law Center at Fordham Law School; Bruce J. Bergman, Partner at Berkman, Henoch, Peterson, Peddy & Fenchel, P.C. ; and Meghan Faux, Director of the Foreclosure Prevention Project at South Brooklyn Legal Services. President Obama’s recent prosecutorial discretion initiative, the Deferred Action for Childhood Arrivals (DACA) relief process will be the focus of discussion. Speakers include: Jennifer Gordon, Professor of Law at Fordham Law School; Marielena Hincapié, Executive Director at the National Immigration Law Center; and David A. Martin, Warner-Brooker Distinguished Professor of International Law at the University of Virginia School of Law and Deputy General Counsel, Department of Homeland Security (2009-2011); General Counsel, Immigration and Naturalization Service (1995-1998). Panelists will analyze the decision waiting to be made in Cariou v. Prince and the impact the case will have on the boundaries of visual art, fair use, and freedom of expression, particularly in visual art. Speakers include: Sonia Katyal, Joseph M. McLaughlin Professor of Law at Fordham Law School; Dale Cendali, Partner at Kirkland & Ellis LLP; Virginia Rutledge, Attorney and former Vice President and General Counsel for Creative Commons; and Christine Steiner, Special Counsel for Sheppard Mullin Richter & Hampton LLP. To register, go to law.com/ethics, law.com/foreclosure, law.com/immigration or law.com/fairuse to register. 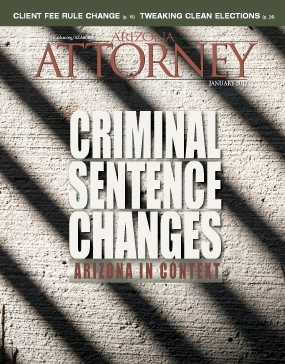 Our cover story in the January 2012 Arizona Attorney examines the prospects for criminal sentencing reform in the state. It quotes numerous people locally and nationally on the topic. Two stories percolating this week demonstrate solidarity in the face of adversity. 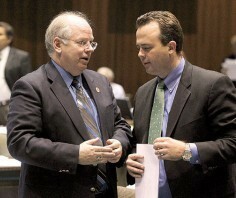 Oddly enough, both come out of the Arizona Legislature. I say “oddly” because recent actions from lawmakers demonstrate an almost unwavering support for a variety of themes: law and order, personal responsibility, a dislike for excuses. But those things fall away when it’s one of your own whose ox is being gored. The first story is about the chief aide to the House Speaker. He was stopped for extreme DUI, and cocaine was even found in the car he was driving. But both Speaker Andy Tobin and former Speaker Kirk Adams stand by Victor Riches. They say they appreciate his “candor” about the 2010 incident. Here is another story about the arrest. It quotes a criminal defense attorney who muses on the different type of treatment that differently situated defendants receive. 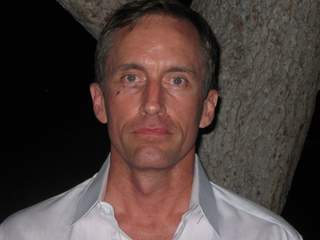 That follows on the heels of the Scott Bundgaard domestic-violence case. Laurie Roberts in the Republic writes about that again today. As Roberts described it, the matter is “perhaps the longest misdemeanor investigation ever.” But how much more abbreviated it might have been if lawmakers decided not to throw their unwavering support behind the state senator. Optimistic readers may hope this all signals a new openness among leaders to arguments that the facts underlying criminal charges are often complicated, and that no one should be demonized until they get their day in court.